Tune in to your favorite feed for the Casey Anthony case hearings this afternoon at 1:30 PM. InSession will also be covering the hearings. Has the defense finally reviewed the TES files? How many depositions remain? Let's hope we find out today. Even though Casey won't be present for this hearing since there will be no motions heard, these hearings have been some of the most informational about what is going on in the case. See you all in court! Not long after being diagnosed with a cancerous tumor in his right jaw, Sprocket died at home with us on Saturday, August 21st surrounded by his siblings. He was 16 years old. I've been blessed with raising several kitties in my lifetime (Tuna Breath, Cocaine, Crash, Katie, Jumpy, Scout), but Sprocket was that "long-time companion" that I had a special bond with. Back in June of 1994, I had been taking care of my friend Jay Schwed's 19-year-0ld kitty, Gooby. She was a sweet-natured kitty but not particularly friendly to me. 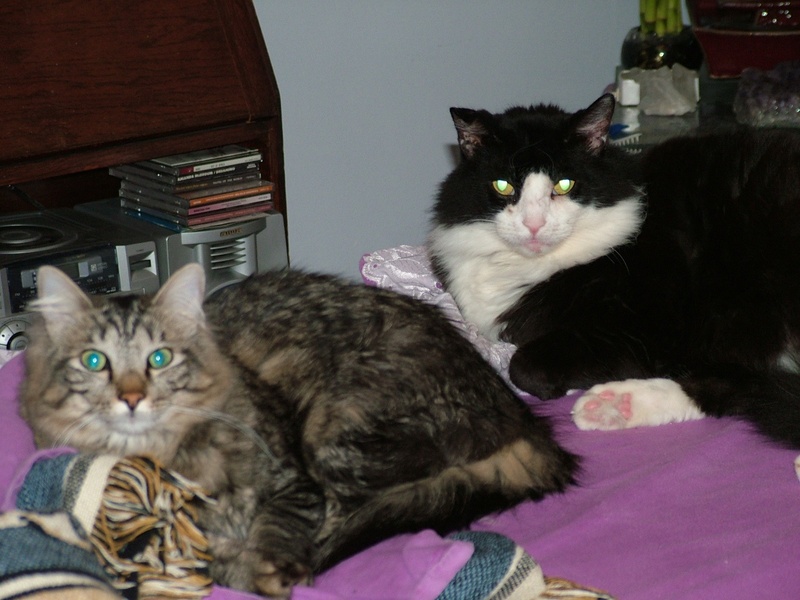 My kitty Crash was only 7 when he died ten months before and taking care of Gooby made me realize I was finally ready to adopt another companion. I put the word out to my friends that I was looking again. Crash was a black and gray striped short hair tabby and I thought this time that I would get an orange tabby. My friends were telling me about people they knew who had new kittens and I did look at lots of kitties. However, I wasn't having much luck finding a companion that seemed like we would be a good fit. I remember it was a Wednesday, middle of June and I was driving down Ventura Boulevard in Studio City. I drove past the PETCO near Coldwater Canyon and something told me to turn around and go back. It was just this strong sense, a feeling that I had to go into this store. Sure enough, there were kitten adoptions sponsored by an organization called "Lifeline For Pets." It was in the late afternoon, and almost all of the kittens were napping but there was this one black and white kitten that caught my eye. Even though all the other kitties were asleep, he still had lots of energy and wanted to play with my long ponytail I put up to the cage. He was a wild, 12 weeks old rescue kitten. I got permission to hold him and he had this wonderful deep purr. It didn't take me long to decide that this little boy was the one. I wanted to take him home right then but the ladies managing the kittens said I couldn't take him home; that my adoption had to be approved by the foster parent who wasn't there that day. 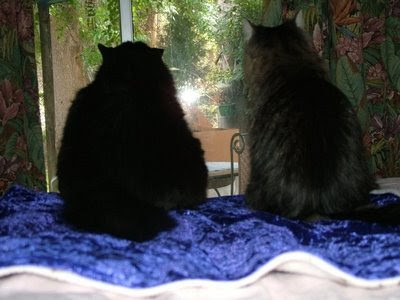 Besides, they indicated that they had to check out my home to ensure it was kitty friendly and had screens on the windows. I was beside myself. I couldn't believe it that they wouldn't let me take him home. They said it would have to wait until Saturday, when they would deliver him to my home and give him his last set of shots. I couldn't wait until Saturday! When my new companion arrived on June 16th, he made himself right at home. One of the endearing things Sprocket did that first night and continued until he was about 10 years old was sleep on my right shoulder. Before he would go to sleep he would do the paw-paw into my neck, suckle on my right ear lobe and purr. As he got older he didn't sleep with me as much but he still occasionally sucked on my ear until he was about 12 or 13. I had quite a few plants in that second floor apartment including seven ceiling height trees and it didn't take long for my new kitty to discover them. That's when I realized that he had more wild energy than my large house plants could take. His favorite game was sitting on the edge of the Terra cotta pots, leaping as high as he could, grabbing on then trying to climb to the top of the stalk before he got hit with the spray bottle. Even shaking 20 pennies in a can like the animal guru Warren Eckstein recommended didn't phase him or deter him from running around the apartment like a maniac. In time, he eventually pulled every single one of the trees out of their pots from climbing them and hanging on until he jumped down. Once he had settled in, it was time to come up with a good name. My last kitty Crash had a motorcycle related name, (his full name was Redline Crasher; Crash for short) and I wanted to give my new companion a motorcycle related name, too. Several ideas I though of were Suzuki ~since I rode a GS750E~, Katana, Basanni, Webber but those didn't seem to fit. I settled on "Rear Sprocket" which eventually became just Sprocket. When Sprocket was five months old, he taught me how to play fetch. I was on the sofa trying to get some paperwork done and he kept pestering me, getting into my papers and pushing them all around. I threw one of his tiny mouse toys across the room to try to get him to go play with the mouse. He ran after it, picked it up, brought it back and dropped it right in front of me. Surprised, I threw it again and he did the exact same thing. I threw it again. Repeat. Twenty, thirty times in a row, he brought it back. Fetch became one of the games he loved to play. He brought it back every time until he was 2 1/2 when he decided he only needed to bring it back halfway before he would drop the mouse. Along with his climbing the house trees, he started to climb other things in the house. Here he is at about six or seven months, hanging out on the front door. And, he liked to get into things. Trash cans became places where he would find new toys. And, he liked to hide behind things like kitties do. 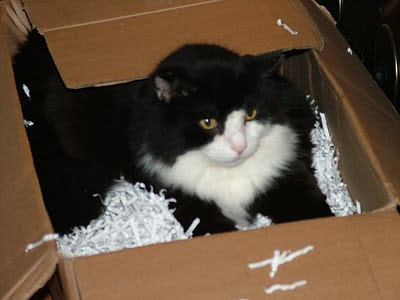 Sprocket, like many kitties became a bag and box lover. Leave a bag or box out and he had to make it his property for a while. ... and when he was hungry. Another difficult task was trying to box up presents around Christmas. ... Sprocket tries to get her to play with him. Here's another attempt to get a playmate. Sprocket got into just about anything and everything. He had a never ending curiosity. I remember one time in the old apartment, I was in the living room and I was hearing this THUMP! THUMP! THUMP! coming from the laundry room. I go to the laundry room and the noise is in the dryer. I open up the dryer and Sprocket jumped out. Fortunately, there had been a full load of clothes in the dryer almost dry when he crawled in. If I left the washer lid open, he would jump in. I finally cured him of that by holding down the lid lever when he got in there one day and turned the washer on to fill it. That cured him; he never got in the washer again. As a kitten, he loved to watch me take a bath. He was fascinated by splashing water and loved to watch it but hated with a passion having to endure the torture of a bath for himself. When he was older, it took two people to bathe him. Another big adventure when he was two-and-a-half was the great escape. I had a long work day and when I came home, Sprocket had vanished from the apartment. I couldn't find him anywhere. Then I looked in the laundry room and saw that the window in the back door was left up and a huge hole had been torn in the screen. He had gotten up on top of the dryer, smelled that fresh air coming in through the window screen and clawed his way out. I was beside myself frantic. I printed up hundreds of flyers and enlisted my neighbors to help me look for him. I crawled under houses searching for him. He was gone for two days. On the third day, I got up real early so I could put some food out on the back stairs thinking that might entice him home. When I opened the back door, there he was, climbing the wood steps. He was black all over, had a few ripped nails and had picked up fleas. But other than that, thankfully no injuries. He got his first and only trip to a groomer to get him white and black and fluffy again. That big adventure started a life long battle with him and his desire to go outside. He escaped many times after that but fortunately never got very far or was AWOL for more than an hour. When he was three I moved into this current house and Sprocket's daily world got quite a bit bigger. There were new things to climb, like the shower door. and try out the fabric boxes. and new clients with shoes to check out. as well as antlers at Christmas. My husband also thought that Sprocket really wanted to go outside and hooked up an elaborate overhead fishing line to attach his leash to that ran from the patio all the way to the back property fence. With his leash attached to the line, he had about six to eight feet wide and approximately fifty feet long to hang out in. Every day he made a loud fuss at the back door until we took him outside. He could chase the squirrels a short distance and watch the birds. We even included him in our backyard wedding. He was to be the ring bearer and walk toward us on his fancy tether. But when he didn't walk toward us like planned, my husband had to retrieve our rings off of his collar. Sprocket loved being outside. However, he became Mr. Hyde when it came time to come back in. It got to the point where I had to throw a towel over him pick him up. When he became almost like Houdini and found a way to wriggle out of his harness his days of being outside had to end. 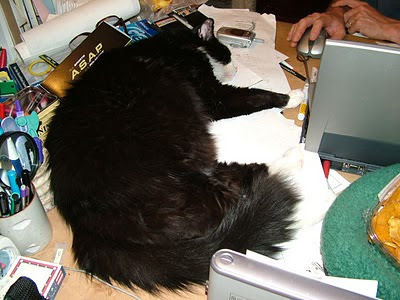 My husband often let him get up on the desk to take a nap when he was working on the computer. When Sprocket turned 10 in 2004 we decided to get him some siblings. My husband didn't know anything about how much fun kittens could be until eight-weeks old Jumpy and Katie arrived. Sprocket wasn't really happy about it, but he tolerated them. Up until then, he got all the attention. ...but that was about it. As the kids got a bit older, Sprocket tolerated Katie and would occasionally let her get near him. Here's a rare photo of them together on the massage table. 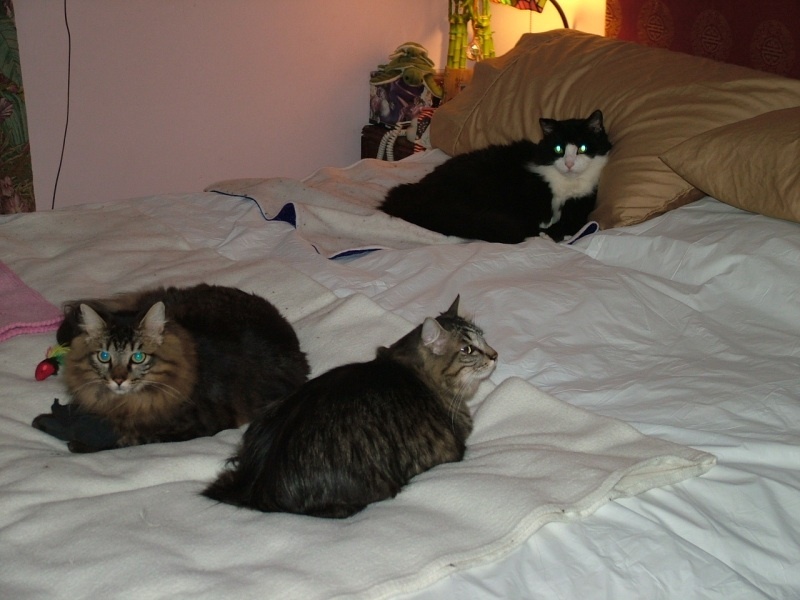 And rarer still, all three kitties on the bed. But as you can see, Sprocket kept a safe distance. After a rainstorm one cold February day in 2006, a stray kitty showed up on our back patio. He was crouching on top of an old cat condo that Katie and Jumpy had destroyed when they were kittens. We slowly gained his trust by fixing up a comfy warm bed inside a box elevated off the ground and regular, tasty meals. The inside kitties watched him from the bedroom patio doors. My husband eventually convinced me to let Scout come inside and meet the other kitties. We knew that Scout had been abandoned because he was already fixed but we didn't know how he would get along with the rest of the fur kids. The first time we brought him inside, he gave an affectionate head tap to Sprocket and then Katie. Sprocket had a fit and hissed at him. He was our inside and outside kitty until a serious bite by another cat (or dog; we never knew) ended his outdoor life. Eventually, Sprocket got used to Scout and on rare occasions would share a drink at the water bowl with him. Scout and Sprocket had a few big adventures together. You can read about how Sprocket left his paw prints in the floor when we had to completely rebuild our kitchen floor last summer. Scout also figured out how to open the latch on the upstairs window that opens over the first floor of the roof. Sprocket followed him out but we were never sure how they both got down off the roof. In the late summer of 2009, Sprocket started to have a ravenous appetite and at the same time, he was losing weight. For most of his life he was a hearty 16 pounds but he was down to just under 13 pounds. I had a hunch what was going on and I took him to get a full blood panel to get it confirmed. His thyroid numbers were off the charts. He had feline hyperthyroid. This would eventually kill him if he did not get on a special diet and medication for the rest of his life. But I was also reading about a treatment that could completely cure him: radioactive iodine. I found Advanced Veterinary Medical Imaging in Tustin, CA. After some finagling, I got Sprocket accepted as a patient. You can read about his week-long stay in the clinic here. Although Sprocket recovered completely from that illness, he never regained the four pounds he lost. In January this year, Sprocket was sleeping a lot and not eating as much. He had a follow-up blood test that indicated his kidneys were not doing too well. I took him to his long-time acupuncturist who gave him a needle treatment. Sprocket slowly started to get better and to speed up his recovery, I started to take him for walks outside. That became our ritual for the next month. He would get to go for a walk in the afternoon. He loved to go in my neighbor's backyard and chew on the tall wild grass. After a few weeks, Sprocket started to improve and get his appetite back. In June, he started to decline again and I took him to a new vet for an exam and tests. The blood tests indicated his kidneys were back to normal but his liver enzymes were off the charts. The new vet thought he had a "non-active" tumor in his right ear. When Sprocket started to have balance problems getting up and down off the big cat tree, we knew we needed a second opinion. Enter the wonderful Dr. Sandy, who makes house calls. Here's Sprocket the morning Dr. Sandy came to see him. Dr. Sandy reviewed all of Sprocket's prior medical records and gave him a complete examination. She had me feel along both sides of his jaw at the same time to show me what she had discovered. There was a noticeable mass on his right jaw. 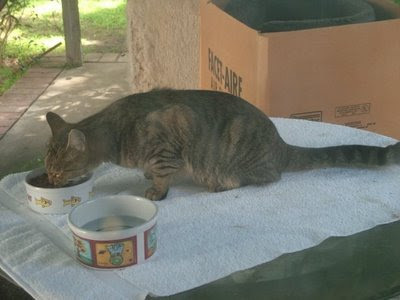 She recommended we immediately put him on a high nutrient diet (Royal Canin Recovery RS) and that we take Sprocket to see Dr. Mills at the City of Angels in Culver City for an ultrasound of his jaw and liver. The people at this hospital were just the best and I will forever be indebted to Dr. Mills for his compassion and kindness that he showed Sprocket. Dr. Mills did an extensive ultrasound of his liver and jaw and also drew aspirates (a needle is inserted and material is drawn out) from both areas. In his jaw he saw a mass that extended around to his cerebellum, the area of the brain just above the brain stem. (It wasn't inside his ear.) Dr. Mills said that the attachment of the mass on his brain was what was causing his balance problems and his inability to control and close his right eye. Unfortunately, the pathology on the aspirates was inconclusive. It didn't tell us anything. The procedure of drawing the aspirates was a big strain on Sprocket's body and it took days for him to recover. I had to decide whether or not it was reasonable to put him through the trauma of a biopsy procedure with anesthesia to confirm what we suspected: that Sprocket had cancer. Without getting a confirmation, Dr. Mills thought with the inconclusive results, it was most likely Sprocket had one of the more aggressive cancers, either a sarcoma or carcinoma that don't give up their cells easily. On July 8th, with tears in my eyes all the way home, that was the beginning of the long good-bye. The goal was to keep him comfortable and the best quality of life possible. It was hospice care from here on. 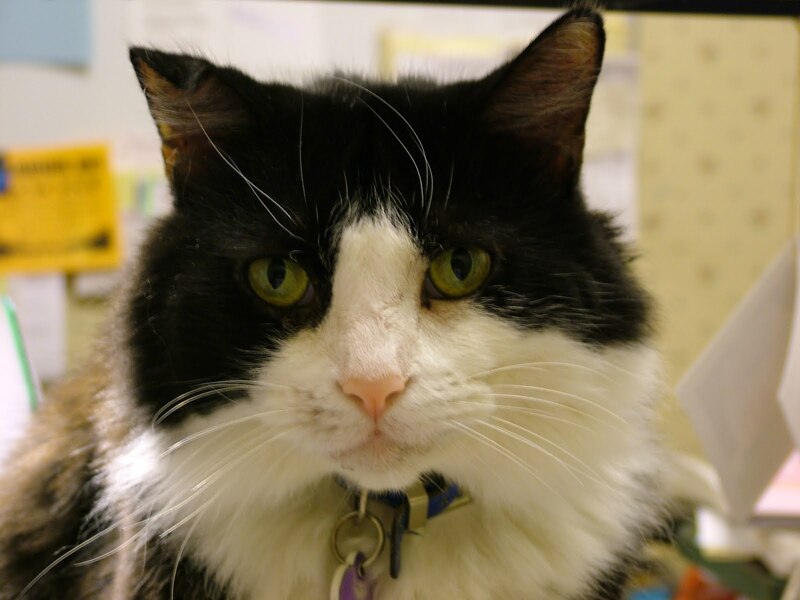 Sprocket was on the special diet, an appetite stimulant and fluids under his skin once a day and later, twice a day. Unfortunately, we had to take his favorite big cat tree out of the living room because he had already fallen off of it once, and he could seriously hurt himself if he fell again. To keep his spirits up, I started taking him for a walk in the mornings and sometimes in the afternoon. After he ate his breakfast he would sit by the back door and wait until I got his harness and leash out. For the first few weeks, he liked to go next door to our west side neighbor, where he liked to munch on some tall wild grass in her back yard and hit his favorite spots in the flower garden. Eventually, Sprocket settled into a routine where he stopped at the back patio, stretched and then walked the driveway to the front of the house. He would stop at the big log, beside the hedge and look into our neighbor's yard towards the east. Then he'd head over towards the front walk. If the sun was out, he would stop at the Chinese coin stepping stone and lie down in the grass. After he was nice and warm, he would walk up the front porch steps and get up on the cat condo. I would sit there with him until he got sleepy and then I would bring him inside. As the tumor grew and spread up behind his right eye, his ability of open his jaw became less and less. I had to puree his special diet food to a pudding consistency so he could eat. Each day, he still wanted to go for his walk outside. He was able to get around pretty well, get to the water bowl and hit the litter box without any assistance. In those last weeks, he spent a lot of time in one of his favorite spots, the back of the sofa. One day, Scout wouldn't move when Sprocket wanted to lie down and I got a rare photo of them sharing the sofa. Often times, I would bring his food bowl there so he didn't have to get down. Here is a short video of him having a meal. The time finally came when Sprocket was no longer able to open his jaw wide enough to get his tongue out of his mouth to eat. It was time to end his suffering and say goodbye. The day before, Sprocket had two nice walks outside. Saturday, he spent all day on the back of the sofa, purring away. He was a fighter until the very end. The month before, I had found this beautiful black and white hinged box in a second hand store. It was cardboard covered with a soft black leather. Inside was a nice black and white paper lining. I made him a black and white kitty mat bed for the bottom and a black and white blanket to cover him with. Lewis suggested we put his favorite brush in with him that he liked to have his chin scratched with. We dug his grave before the doctor arrived and afterwords we buried him in the back yard next to Katie. As soon as we can, we will engrave a large river rock with his name. I hope you enjoyed reading Sprocket's story. He was a wonderful companion with whom I had a close, special bond. We will never forget him for his memory and funny antics will always reside in our hearts. Sprocket on a pile of blankets, ready to be sewn. Jose Baez and Cheney Mason ask Judge Perry to ENGAGE THE CLOAKING DEVICE! Today, August 25, Jose Baez and Cheney Mason filed two more "objections". One has to do with the visitor logs and one has to do with the release of financial information. Each comes with an example of how the Sunshine Laws are being abused by the Media. In the first notice of standing objection, the defense did not only object to the release of information by Corrections (the jail), but also information released by Law Enforcement and the State Attorneys office. The second and third notices add the Justice Administrative Commission. We will be having a Status Conference next week on August 30, followed by a schedueling conference at 1:30 and 2:00 PM. It will be interesting to know if the judge addresses these at that time. Yesterday, Casey Anthony's defense team filed a Notice Of Standing Objection Of Abuse Of Florida Statute Chapter 119.01. Chapter 119.01, the Sunshine Law which prevails in the State of Florida, has very few exceptions and the defense has tried time and time again to get a judge to seal documents in the Casey Anthony murder trial proceedings. They've asked for her jail visitation videos, visitor's log, and any other jail-related document to be cloaked in secrecy. Judge Stan Strickland and Judge Belvin Perry have pointed out time and time again that Chapter 119.01 is the Law of the Land there and there are few exceptions. They have also told the defense that they lack the power to rule on jail procedures. They have said over and over again that the Judiciary Branch cannot tell the Executive Branch what they should do. They have informed Casey's attorneys that they must abide by the laws as they exist. 4. It has been and continues to be the Defenses (sic) position that the First Amendment rights of the media must give way to the constitutionally protected rights of the accused, especially when the State seeks the ultimate penalty of Death. Compare this to the statement Jose Baez made November 28, 2008 when Judge Stan Strickland denied the State's gag order. 7. The only purpose of this type of coverage is to embarrass, harass and humiliate the accused and poison the potential jury pool. I suppose that, having prevailed in the gag order issue, the defense feels it has the right to poison the jury pool. In their arguments, Baez and Mason refer to an attached WESH article which discusses Casey's latest commissary order! Baez has a much larger agenda here, folks. He wants Judge Perry to order reverse prior rulings! 5. This objection is standing and continuous and the Defense invites this Honorable Court to either reverse and prior rulings as it relates to public disclosure or Sua Sponte order the aforementioned agencies to prevent any future abuses of Chapter 119.01. It's not going to happen, people. Two judges have ruled and the defense keeps on trying. There is no way Judge Perry will reverse his and Judge Strickland's rulings. The laws clearly state that, with very few exceptions, the public has the right to know. If the First Amendment is good for Baez, it's good for Casey Anthony. So, were Casey's parents to visit, we will see the videos. Should Casey have an intriguing new visitor, we will see the log records. Should Casey order a new bra, we will know. BEAM ME UP, SCOTTY! I'm done! On Monday, August 16, 2010, Judge Belvin Perry summoned defense attorneys Jose Baez and Cheney Mason to his chambers for a meeting with the prosecution attorneys and TES attorney Mark Nejame. When it was all over, Baez and Mason held a PRESS CONFERENCE somewhere in the courthouse. The majority of the session was purely the defense spin on the meeting with both attorneys claiming a victory. Baez began by reading (on his iPad) what the defense had claimed concerning Brad Conway and the State's Attorneys access to the documents, that they were able to have unlimited time and were able to take notes. He then went on to refer to Conways's actions the prior week as a "sideshow" and that he "had a case to try" and was far to busy to deal with this stuff. He then made an interesting comment that the ability to tab documents was equivalent to taking notes! If that were true, then I wouldn't be at all worried about the judge's written ORDER which was dated August 19, 2010. Unfortunately, that doesn't seem to be the case. This is what NeJame had asked for in his previous motion. I'm sure he realized this was necessary if the defense were to have additional access to the searchers' names. b. If the Defense identifies what is (sic) considers to be relevant or material searchers after its inspection and investigation, then the attorneys for Texas EquuSearch, the State and the Defense shall attempt to determine whether disclosure of the documents should be released to the Defense. If an agreement cannot be reached, then the identified file or documents shall be tabbed and brought before the Court for a hearing subject to the conditions set forth in the previous Court Order. This provision adds one more layer onto the review process. In the original order, the State and Mr. NeJame will have a chance to voice their opinions concerning the documents prior to them being tabbed and given to the Special Magistrate. c. That the location of the review shall be mutually agreed upon by the parties and counsel for TES. TES has agreed to bring the files to the agreed upon location by the Defense and Magistrate Glatt. Obviously, the defense had a hard time being in NeJame's office to review the documents. Now, the game will be played on neutral territory. Let's hope things go more smoothly now. In the presser, Baez also stated that they couldn't get into the details of the meeting because it's under seal. After reading both orders, I must say that there is nothing under seal that relates to the review of the TES documents. I dare say, much of what is under seal is the "spanking" the attorneys received for all that bad behavior. How I wish the fly that was on the wall at that meeting could whisper in my ear! It's clear that getting rid of Judge Strickland didn't benefit the defense at all. This was the last item in the motion the defense made for "do-overs". Judge Strickland's ruling still stands with the exception of the notes. Cheney Mason summed up the defense stand on the issue by saying that the the issue is now "moot" and there is no need for a hearing. I'm sure the defense was glad there wasn't a hearing in open Court! The battle over the TES records has reached new heights as George and Cindy Anthony's latest attorney, Brad Conway resigned as of their attorney. This latest development comes after a heated trading of accusations between Mark NeJame, TES counsel and Jose Baez, Casey Anthony's long-time "lead" attorney. Of course, the infamous "Exhibit "B" contains the letter from Conway's clients to Mark NeJame, in which they rescinded their waiver. This was probably the same waiver of conflict of interest that Conway had waved before the court on more than one occasion to bolster NeJame's assertion that there was no conflict of interest in his representation of TES. 4. In the Defendant's response they falsely claim that the undersigned compelled a waiver of conflict from Mr. and Mrs. Anthony in exchange for allowing their attorney, Brad Conway, to review the TES files. 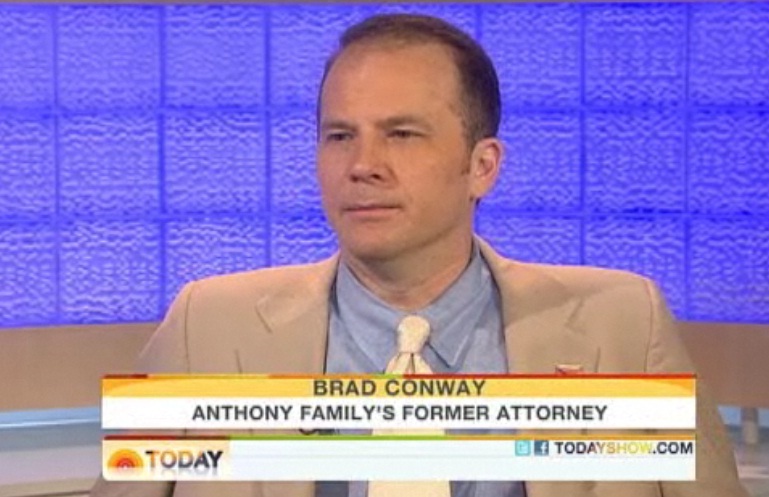 In the time that the Defense took to write this ludicrous and untrue response, they could and should have performed their due diligence and contacted Brad Conway, attorney for George and Cindy Anthony, who would have informed them that these allegations were frivolous, untrue and lacked any measure whatsoever of truthfulness or veracity. Mr. NeJame has communicated with Mr. Conway as recently as yesterday morning and Mr. Conway reconfirmed that no consideration was offered whatsoever to review the TES documents and that Mr. NeJame's act was that of compassion for the grandparents, with no consideration of anything in return. The defense attorneys should have simply done a modicum of work or expended the most minimal effort by checking their facts and calling Mr. Conway, rather than filing deceptive, untruthful, irrelevant and outlandish pleadings. Mr. Conway is an ethical, respected member of the Bar and is well aware of the truth and the facts surrounding this specious allegation contained in Defendant's pleadings and confirms them to be untrue. This latest claim by the defense placed Conway in an untenable situation in regards to his clients. NeJame is clearly stating that their attorney has verified his position. With regret I am forced to resign as George and Cindy Anthonys attorney. The defense motion filed on August 9, 2010 contains allegations that are not in fact true. As an officer of the court I cannot stand idly by knowing allegations involving me have been misstated. I am now a witness to an inaccurate legal pleading filed in our court system. As such, I cannot continue in good conscience as a legal representative. 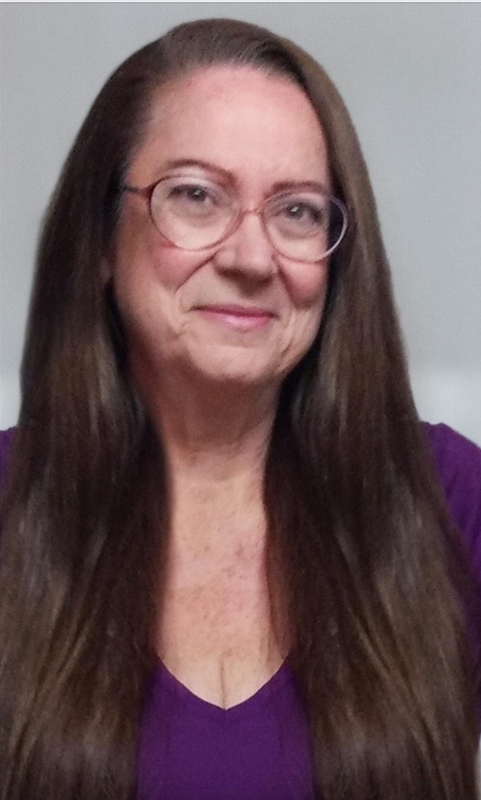 George and Cindy Anthony have done nothing improper, it is the failure of the defense to verify the facts alleged in their motion that forces my withdrawal. I will continue to support the Anthonys, will continue to attend hearings and the eventual trial and most importantly I will continue to search for the full truth regarding the killing of Caylee Marie Anthony. Notice that Conway doesn't put any of the blame on Georg and Cindy Anthony. He puts it all squarely on Baez, as well he should. The defense did not verify their facts and he joins with NeJame in indicating that that is the issue at hand. Conway couldn't say anything else without breaching his attorney-client privilege. However, one has to wonder if he was ticked off at being the conduit for information between the Anthony's and Mark NeJame. See Baez' Exhibit C.
I have a feeling he's felt like the monkey-in-the-middle for a long time. Now, he has jumped out of the middle and steered himself closer to Mark NeJame in regards to the waiver of immunity. Brad Conway sat in my office with me and Andrea Lyon and told us that the only way he could view the documents was if George and Cindy signed a waiver. I'm not really sure if that answers the question, we'll have to watch the news coming out. Stay tuned here for updates! The obvious question is, what happens next? Will there be a TES hearing with the laywers duking it out as to who is telling the truth? 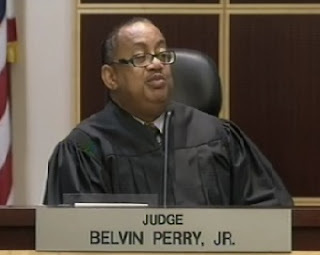 Will Judge Belvin Perry simply rule in chambers on the merits of the motion? Will he call all the attorneys into chambers for a "Come to Jesus" talk? Will their be charges to the Florida Bar? So many questions! Your guess is as good as mine! MyFoxBoston.com is reporting that accused "Craigslist Killer" Philip Markoff has committed suicide. He was pronounced at 10:20 am ET. 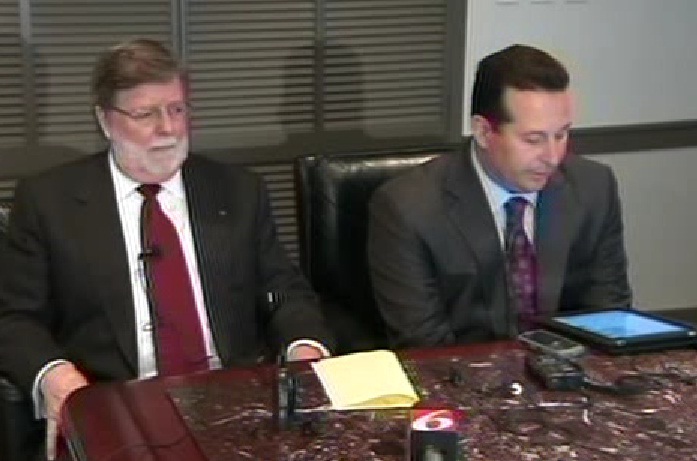 His defense attorney, John Salsberg confirmed the report that Markoff apparently suffocated. I just got my hands on Mark NeJame's Reply to Defendant's Response to Motion to Quash the Court's Order on Defendant's Application for Subpoena Duces Tecum for the Documents in the Possession of Texas Equusearch Based on Bad Faith. Since Mr. NeJame doesn't "leak" his motions to the media prior to them being filed with the Clerk of the Court, I had to wait for Muzikman to post them. Thank you so much! ...the documents in the possession of TES are no longer relevant to the Defense since Mr. Mason has publicly acknowledged in a television interview to a variety of media outlets that no searchers were able to search the exact area where Caylee Anthony's body was ultimately found. Uh, yeah, it's been, the public has been made to believe that these people searched the exact area, um, where the body was, or tried to and couldn't. The fact is they didn't try to, and they didn't, they weren't there, and it was impassible at the time. So there's a lot of people who are mistaking things of what happened back in the summer of 2008 and what happened in the Winter of 2008. He also includes a disk which I assume contains a copy of that particular presser. NeJame also says that it was the defense's previous position that there had been TES searchers at the exact spot, which is the reason Judge Stan Strickland accepted the TES recommendation that the only the names of those searchers within a specific distance of that spot be released to the defense. Now that the defense has changed their stance, as indicated by Mason, the TES documents are not relevant at all to the defense. That's what his entire argument was in his original motion filed with the court, and it is the only argument he puts forward here. It is plain and simple and based upon Cheney Mason's own words. It is so simple, it puts to shame Mr. Baez' response which I attempted to dissect in my previous article. I don't know why I even bothered. I was replete with lack of logic and clarity. It was mainly a smear job of Mr. NeJame. In his response, NeJame gives Judge Perry the facts as he sees them. In his response to Cheney Mason's version of events the day of the document review, NeJame tells the judge that the behavior by the Defendant's counsel was the "epitome of unprofessionalism". He states that he did not attend the session "in order to preserve order and allow the Defense counsel in an unobstructed manner to focus on reviewing the documents..."
He did have another attorney, Ms. Balani in the office in case there was a problem. That attorney, to allow them to view the documents without an attorney present, went to another room. Bill Fitzgerald, the TES monitor was informed she was available. Oh, and by the way, those documents in the two boxes were indeed administrative documents which had nothing to do with the searchers. NeJame again points out the long delay of nearly eight months before the defense ever came to review the documents and that the only reason they want them all is to harass the searchers and create "spurious appellate issues". There's more there, but I know you will be reading it all! NeJame then goes on to blast the defense's apparent "flip-flop" by Mr. Cheney in the presser. Again, as a lover of language, I must quote a bit of it. ... The claim by the Defense that this was "mischaracterized" is nothing more than a shabby spin and feeble attempt to minimize the contradictory and dueling statements that have been made by Mr. Mason and Mr. Baez. The Defense Response is simply a ploy to fix their self-induced and self-inflicted mess. And what a mess this whole TES issue has been! (the discussion) was regarding the general opinion from seasoned and experienced attorneys and undersigned counsel's opinion that a competent attorney should have and likely could have worked towards a plea deal that might have possible secured a deal for 10-15 years for the Defendant, prior to Caylee being found, so long as the Defendant led law enforcement to where Caylee was and truthfully told what happened to her. That possible deal would have been impossible once the body was found. Before his closing statement, NeJame hopes that if more names are given to the defense, that they not be released to the public. Likewise, the names of the 32 searchers should also not be made public. Again, NeJame asks the judge to quash the subpoena. Let's hope this motion makes it to a hearing. It would be well worth watching. This video of Tim Miller was posted on YouTube on December 15, 2008. Within the first couple of minutes, Miller again reviews the reasons he called off the searches. The area they wanted most to search, on Suburban Drive, was flooded. Mr. Miller, in his interview with the State says the same thing (p. 8). He clearly indicated that, if Caylee's remains were there, a search could easily destroy them or force them into the underlying soil. Regardless of those facts, the defense went on an immediate rampage to get the TES records to prove that the area had been dry and searched. To do that, they petitioned the court twice and were rebuffed twice by Judge Stan Strickland for not filing their motion in a proper way. Macaluso indicated that the evidence they would unearth would be exculpatory because it would prove Casey is innocent. He argued that if a person volunteered to search for a missing child and found the child, the remains, or evidence, there would be no expectation of privacy because the person would be a material witness. In later motions, the defense claimed that they had two witnesses, Laura Buchanan and Joseph Jordan who would testify that the area was searched by them, that it was dry, and that there were no remains there. Later, Jordan was interviewed twice by LE (#1,#2) where he indicated that he had mid-identified the area where he searched and that he hadn't searched that location, since it was under water at the time. Laura Buchanan, the second witness, seems to be making herself scarce and has yet to be deposed by the State. At that time, TES attorney Mark NeJame offered the names of 32 searchers who were within 50 yards of the area where Caylee's remains were discovered. Judge Stan Strickland ruled that the area relevant to the defense's argument would be so limited and that the defense could examine the other documents under the terms proposed by Mark NeJame. In the hearing on July 15, Judge Belvin Perry did not address the TES issue in open court. The prosecution, defense, and NeJame met for a substantial period of time at the bar and when it concluded, Perry announced that Baez was withdrawing his most recent TES motion and that NeJame could file a motion to quash the motion based on bad faith. The defense would have until August 25 to review the documents with a special magistrate and would be able to take notes. They were to tag files which the special magistrate (a former judge) would copy and bring to the court for in camera review. The judge also said that he would not rule on the tagged files until after a hearing on the motion to quash. On July 22, 2010, Mark NeJame filed his Motion To Quash The Court's Order On Defendant"s Application For Subpoena Duces Tecum For The Documents In The Possession Of Texas Equusearch Based On Bad Faith. In this motion, ordered by Judge Perry at the July 15 hearing, NeJame outlines the entire history of the TES battle with the defense team. Dates and information here and above were taken from this motion. I've added a few dates in for myself as I feel they may be relevant. Prior to the appointment, NeJame learned that they were planning to send "The Presentation Group" to copy all the documents from all the files. Baez cancelled the appointment. October 15, 2009: NeJame's office contacted Baez to ask when he would pick up the 32 files. When asked to fax them, NeJame chose to have them hand delivered to Baez' office. November 23, 2009: Baez files a new motion for a subpoena duced tecum based on the information provided by Joe Jordan and Laura Buchanan stating no body was found. March 10, 2010: NeJame responded by pointing out that Joe Jordan was one of the 32 searchers whose records were provided to Baez, Laura Buchanan searched the area on her own, hence no official record. April 5, 2010: Judge Stan Strickland denied the motion. April 16, 2010, 4:48 PM on a Friday afternoon: The defense files a motion for Judge Stan Strickland to recuse himself. April 19, 2010: Judge Stan Strickland issues an Order and recuses himself from the case. I have always wondered if the TES issue was one of the reasons that the defense wanted Strickland off the case. They wanted all the documents and weren't happy at all with Strickland's rulings on the issue. April 23, 2010: Jose Baez and Cheney Mason appear at Mark NeJame's office to inspect the documents. Here are snips from paragraph 12, p. 9 of the motion. ...The office of the undersigned counsel also learned that when the meeting was scheduled, Mr. Baez had to leave within two hours from the start of the meeting to go to another appointment. ...With the $12 prepaid throw down by Mr. Mason and Mr. Baez' limited schedule, it is patently obvious that there was no real interest or good faith attempt to review any of the document that counsel for Casey Anthony has claimed were important. ...This is entirely consistent with the fact that it took them from August 22, 2009 until April 23, 2010, to finally get around to even coming by to peruse the documents...a full seven (7) months and twenty seven (27) days later. In addition, during the inspection, the attorneys tagged files of searchers from 300 yards away to 8 miles away, clearly outside of the parameters they were given. It's patently clear to me that, from the get-go, Baez and whichever attorneys were on the team at the time wanted ALL the documents. Since their original motion specified a specific search area and the defense agreed in August, 2010 to the solution provided by Strickland gave them everything they asked for. Even now, they want another try at fishing in the TES pool of searchers, without any limitations. The searchers either tried to or were unable to search the area where the body WAS. It was impassible at the time. NeJame then went on to use this quote as the basis of his argument for bad faith on the part of the defense. 18. a. The defense took seven (7) months and twenty seven (27) days to review the files located at the undersigned counsel's office. b. The defense stated in several of their motions that Joe Jordan was part of the search team that searched the exact area where Caylee's remains were found and that his name was not turned over to the defense in October 2009. The defense's position regarding Mr. Jordan formed a substantial part of the basis for their request for the records of the other searchers. c. Laura Buchanan was named in several of the defense's motions as being another searcher who was in the exact area where Caylee's remains were located... It is not only unrealistic but it is ludicrous to expect TES to keep track of or to even have knowledge of the searches that volunteers conduct on their own and not under TES's guidance or supervision. d. ... The defense only took two hours to review the same documents compared to the many hours up to several day (sic) to review. Instead of following the order which requires them to request an in camera review by the Court.. the defense filed a motion to Reconsider Certain Prior Rulings by a Disqualified Judge. The defense is clearly operating under bad faith and looking to harass the volunteers. e. ... Mr. Mason's statement on June 21, 2010 blatantly and clearly contradicts the position they have held for the last 11 months. There are NeJame's reason for asserting bad faith. For me, the bad faith seems to come more from the fact that the defense never showed much interest in tagging any additional searchers who could help their case. They flaunted the judge's ruling and turned it into a ridiculous farce. Nejame winds up his motion by going back to Mason's statement in the presser. 19. ... it is patently obvious and apparent that the defense knows the conditions of the area, and that they are no longer in need of the names of any searchers to verify this information. Furthermore, since the defense has become aware of this information, the original thirty-two (32) volunteer names that were turned over in October 2009 are no longer relevant and any further inquiries of any additional names would be a fishing expedition made in bad faith. Now, let's get to the defense's Response To Motion To Quash The Court's Order which was published last night. As WFTV has now published links, we learn that it was filed at 4:54 PM yesterday. Here is where we find an awful lot of CARP! The motion is filled with vituperative language at every turn and has whole sections which do no more than sling mud at Mr. NeJame. There are four "Exhibits" which mostly do more of the same. 1. It is apparent that counsel for TES has chosen to not understand the clear and direct theories of defense with respect to his client's "searching" for the victim. This is really a simple proposition that everyone else seems to grasp. Baez then explains the defense theory. Here are some snippets of it. If any evidence exists of persons searching the specific area where the remains of the child were found, and no such remains were then present, but obviously showed up later at the same spot, then significant questions arise as to when and how the remains were placed in that location. It is the Defense position that Casey Anthony was either in custody or under such relentless and continuous public scrutiny that she could not have placed the remains of her child, where discovered, any time after the Texas Equusearch searches. The final TES efforts at Suburban Drive were in early November. As Tim Miller stated in the video, the exact area where they were found was still not searchable due to the flooding. A quick study of the State's forensic botanist would show them that he estimated the body had been in the same location for a minimum of 3 months based on the plant growth through holes in the bones. In addition, there are other reports that stated that the body had been disarticulated in that location. I won't go into the gory details, but the position of the bones clearly demonstrated that. In addition, bones were located at a pretty good distance away from the bag. There were bones covered by soil that had to have been there when there was rain to wash the soil onto them. Of course, somebody could have placed the body there. However, the fact is that from the time hurricane Faye hit until shortly before the body was discovered, the site was under water. In addition, Baez later differs from Todd Macaluso who claimed that would prove Casey's innocence, he did admit it did not rule out Casey as the killer. In that case, he would really know some truth of the matter from his client. Even he and his investigators have yet to find "Zanny" and LE hasn't found her either! In his second argument, he pushes to justify having all the records by stating that some Equusearch searchers did search other places on their own. He wants the ability to contact them and ask. Texas Equusearch has professed to have a desire of trying to help, and trying to seek the truth. Yet, when it comes down to inquiries about what evidence there may be regarding the search, they have taken a consistent position of obstruction. It may well be that it is more the influence of Texas Equusearch counsel for his own private and personal reasons, more so than the organization itself. 4. Counsel for TES...apparently acknowledges that it is the position of his client that their records do not indicate any searchers in the immediate area where the remains where found. If that is the case, then it is patently absurd for them to take an obstructionist position of trying to suggest or, for that matter, for the prosecution to suggest, that the remains were there the whole time and just simply not discovered. Again, Baez needs to read the scientific reports, or check with his own experts on this. It seems to me that before he continues this endless battle, he needs to consider what they all have to say about how long the remains were in that location. Paragraph 5 brings up a problem. Baez states that the defense theory was based on information received from Buchanan and Jordan. Yet, months before this, Macaluso used the same theory in open court! He then states that the defense had discovered two witnesses who said the area was not under water. That would again be Jordan and Buchanan. As I've said countless times, Jordan no longer agrees with that. Haven't they read his interviews? That leaves one deposition-shy witness! Moreover, at the time of the TES searching, much of the area was so overgrown that it could not be seen from the road right away and, thus, a person walking along there could not even tell whether the critical area was actually underwater or not. I would assume that Tim Miller and his crew as well as any others who might be searching the area would go off the "road right away" to check the area! ... because the overgrown conditions made it basically impossible. I read some of the interviews with some searchers. I'm not sure if they are the same ones the defense deposed, but I recall them talking about not searching there because of the water. I have to wonder if the defense has more information that they only searched along the "right away"! That is that he allowed an attorney, not related to the Defense of Casey Anthony, to view al14,OOO pages of documents, making whatever notes and conclusions he wanted to do, and then allowing the State to do the same thing. Baez then refers the judge to Exhibit A, an affidavit from Cheney Mason. He gives his version of events during their review of the documents in April and insists he was quite polite! There follows a discussion of the boxes they were unable to view and then goes on another rant about Brad Conway being able to review the documents. We all watched the hearings, we know what NeJame told both judges about that review. Yet, Baez has to toss in some inaccuracies yet again! There were no issues of privacy raised then; no indications that that lawyer was restricted from having copies or making notes; no indications that that lawyer had to pay cash in advance to look at the files. Where is the "bad faith" now? From this point on, the motion goes into a major slam-job on Mark NeJame and is full of accusations which have absolutely no relation to the issues discussed in the motion. There are additional exhibits to back up the claims. Entitled: Does TES counsel. NeJame, have an ulterior motive behind his efforts to thwart the Defense? I won't even dignify this part by a major discussion. This is truly the CARP part of the motion. -of soliciting George and Cindy as clients. Baez utilizes Exhibit C to demonstrate this. You have to read this stuff to believe it! It's a copy of e-mails sent to Beth Karas prior to the July 15 hearing! Talking about leaks! The bulk of the information is an letter sent to NeJame and a reply. The fact is, with all this CARP, one has to rely a great deal on credibility. Who do we believe, Mark NeJame or Cindy Anthony? Mark NeJame or Jose Baez. You pick. The next CARP is the issue of conflict of interest. In this, Baez refers to Exhibit B. It's an unsigned letter from George and Cindy Anthony dated February 12, 2010 to NeJame, rescinding their waver. Again, ask the credibility question! Gee, can I rescind my waiver I signed with the insurance company and ask for more money? defenses position that Mr. Nejame is using this case to further promote his own interests. The last accusation is that, oh my goodness, Mr. NeJame consulted with crime writer David Lohr about the possibility of ghost-writing a book! Baez even includes a transcript of a phone interview between NeJame and defense PI Jeremiah Lyons. The most interesting aspect of the interview, Exhibit D, is that Lohr claims NeJame told him Casey was offered a plea-deal for 10 years! There are statements from NeJame in this WFTV article. Baez ends his motion by playing nicey-nicey with Judge Perry. 15. This Court, after having reviewed the history of this case, with respect to the subject ofTexas Equusearch documents, has crafted a method and announced intentions, by his Order, to allow a proper investigation of the Texas Equusearch documents under the control of a Special Magistrate (Jim Glatt). This process will eliminate all questions regarding the Defense's entitlement to full discovery, eliminate questions of impropriety, eliminate bickering between counsel, and allow this case to proceed on in an orderly fashion, respecting the due process rights of the Defendant, Casey Marie Anthony, as well as her Constitutional entitlements to the effective assistance of counsel and the Supreme Court Mandates, recognizing that "Death is Different". The TES Motion to Quash should be denied, summarily. The fact is, were the judge grant the motion to quash, the defense would see no more of those documents! I can't wait for this hearing!